Great British beef produced from native Aberdeen Angus cattle. Aberdeen Angus beef characteristically has a fine marbling of cream fat running through the meat, this results in succulent tender and richly flavoured beef. 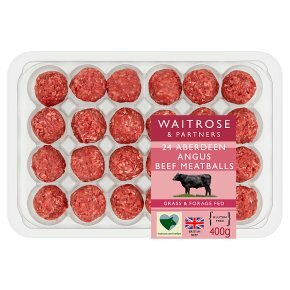 INGREDIENTS: Aberdeen Angus beef (95%), rehydrated (potato), rice flour, sea salt, salt, black pepper, preservative sodium sulphite, maize dextrose, antioxidant sodium ascorbate, water. Pan Fry. Time: 12-14 minutes. Heat 1tsp of oil in a frying pan. Add the meatballs, turn frequently to prevent burning. Cook thoroughly until the juices run clear and there is no pink meat. Grill Time: 12-14 minutes. Grilling Instructions: Preheat grill. …Place meatballs on a grill rack under a medium heat turning frequently to prevent burning. Cook thoroughly until the juices run clear and there is no pink meat.